"You know a lot of people go to college for 7 years…"
Last night I took the final final of my undergraduate degree. Today I’m thousands of miles away, celebrating my newfound liberty somewhere above the Pacific Ocean on my way to Northeast Asia. That’s about par for the way our modern world operates. It took me eleven years and four institutions in states from farthest points American west to east, but it all worked out in the end. I nabbed a few credits from high school and the local community college in Palmer, Alaska. I survived the fall semester of the turn of the century as a student-athlete in a private college near Seattle. A state university in the heart of the Midwest accepted me on academic probation, allowing me to work and study at the same time. Yesterday when I finished my last exam, it was in one of Boston’s oldest institutions. The university experience is a pivotal one… that’s why I chose to drag it out for over a decade. It was an odd route, unconventional at the least; but I wouldn’t have had it any other way. 1. Live as if the “real world” is right now… because it is. Many of us have effectively spent our lives focused on the past or the future, but he who understands how to be successfully present is one who will bypass a million other battles. Ironically, it seems that the students who are most at home in the here in now are the stereotypical partiers who left home for that very reason. But anyone who is engaged and thinking about how to truly love and change the world should also recognize the importance of the present moment. Especially in the West, we like to talk about things so much that we actually think we’re doing them. This danger is particularly ripe in the university years, and we must keep ourselves from growing callous by actually dreaming and doing, plotting and pursuing, analyzing and acting on the blank canvas before us. The world’s not going to wait for you to finish four years of schooling. I took a class called “The Psychology of Adolescent Development” a year or so ago, and in the thick of our discussions of all things pubescent we approached a term called “moratorium.” Now I know this word is all-too-easily associated with “mortuary,” but stay with me for a moment beyond the cemetery. Moratorium is used in legal terms to describe a temporary prohibition of a certain activity. For instance, offshore drilling in the Gulf of Mexico is currently (for good reason) under moratorium. In adolescent psychology “moratorium” refers to a stage of development in which an individual hits identity crisis, exploring with a variety of idealistic outcomes but slow to commit to any one of them. I see the college years as one such period… a temporary pause enabling students to reevaluate and purposely choose the life they want to live. It can be an especially fragile time for a person, but it also has the potential to be incredibly fruitful. The grand idea of the university is to establish an atmosphere conducive to such sanctioned exploration, and that facilitation should not intimidate us. Parents win incredible battles for their children, but any good mom or dad also knows they can’t mandate their son or daughter’s future. Allowing, and even valuing moratorium will teach both the parent and the child the intricate balance between taking and losing control, a faculty demanded by anyone desiring a sincere existence. 3. Remember that your professors are humans. 4. Watch out for cynicism. University trains us to criticize the world. At times the world deserves a little scrutiny, and investigation produces good change. But too often we are left with an inability to see with hope. It is so very easy to deconstruct an idea, but to be a builder in the midst of the deconstruction is the highest calling and the greatest need of our generation. I absolutely loved my Intro to Anthropology course; it caused me to healthily evaluate more of my presuppositions than any other class I had taken up to that point. And yet, toward the end of the semester I began to realize that all this dismantling had no end in sight except more dismantlement. Post-modernity is defined as the absence of a meta-narrative. Such absence creates a society full of fragments, with no foundation to hold them up and no adhesive to keep them together. Dare to believe in possibility, and to act on that belief with a constructive response to critical analysis. Otherwise you’re simply adding to the noise of disenchanted chatter. 5. Create intentional gaps in your formal schooling. “…then something Tookish woke up inside him, and he wished to go and see the great mountains, and hear the pine-trees and the waterfalls, and explore the caves, and wear a sword instead of a walking-stick.” –JRR Tolkien via Bilbo Baggins (The Hobbit, 1937). In order to cram 4 years of schooling into 11, I had to take a few breaks along the way (I also successfully suffered through my last math course 4 years ago). Out of high school I went straight into college because that’s the obligatory route. For some reason our society is well accustomed and deeply content in meeting unspoken requirements like college within a specific time frame. So many of my recent classmates have no experience with which to contrast or apply the information they are consuming, and most of them will quickly lose what little interest they entered with before it’s all over. Still many of them endure for four years; worried by the constraints they have built for themselves. My freshman year I lasted a single semester and took an “incomplete” in soccer for never returning the school shorts. At the end of the autumn I appeased the itch in my feet and set off with a ticket around the world. I spent the same amount of money both semesters but gained invaluable (and much different) maturity from both. Obviously I took this to the extreme, but it can be as simple as taking a semester to study abroad. Volunteer for a non-profit. Attend a character or leadership school for a season. Anything that gives you an intuition with which to combat your growing intellect. Anything that makes your desire less of a taunting stranger and more of a friend. Anything that widens your perspective and helps you realize the world is bigger than your world… that’s a wonderfully transformative thing. It’s going to bring actual function to the factual framework college creates for you. 6. Ask bigger questions of your life and learning. This past semester I spent student-teaching several classes of high school freshman. I felt an unusual amount of affection for these teenagers I had gotten to know over the few months, so I gave them a final charge of sorts on the day of my departure. The crux of my monologue: “Engage with the difficult questions in life that most people try to avoid.” The worst thing in the western world is an apathetic person – a problem our parents didn’t face when they were in college during Vietnam. We face unimaginable distraction. We suffer from temporal myopia. We live with few concrete answers in a world that demands 9 to 5 decisions. The university years should establish an appropriate comfortableness with the notion of mystery, or as a revered Jewish rabbi once said, “losing your life” in order to truly find it. We must rediscover and protect the wonder that naturally first led us as children. And we must remember that a vital part of good inquiry is the necessity of great listening. Don’t get overindulgent in your own growth. Make sure your personal transformation is always headed to the outside of you, and toward those who need to feel its reverberations the most. The geography of my university pilgrimage has taken me from America’s west to east, though in many ways the existential path went much the opposite. It is my hope that the two worlds can effectively collide, and it is my conviction that they must. We desperately need the mind of the west – creative and individualized – to interlock with the heart of the east – a disciplined development of character – drawing together the best of both traditions and giving the university back its purpose. I believe in education because I believe in learning. I believe that curious, questioning students, filled with awe and wonder, will find meaning and help define it for an ever-changing society. 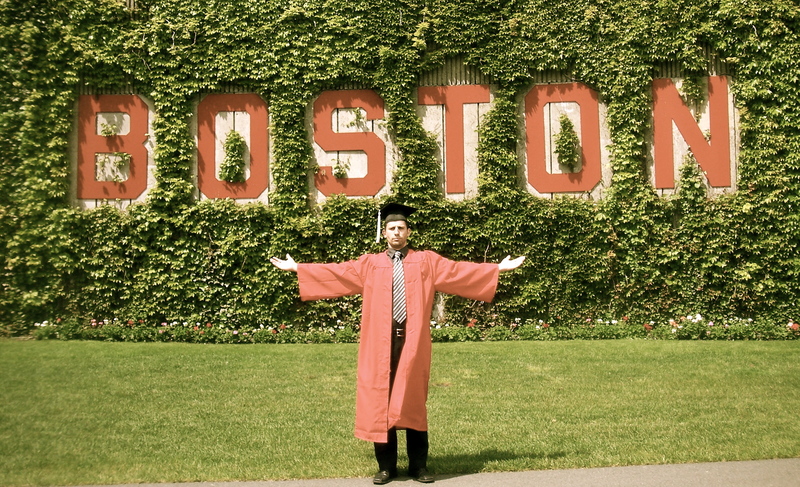 Take it from me… I have a college degree.